7 Kids and Us: Sofia the First Holiday in Enchantia Giveaway! 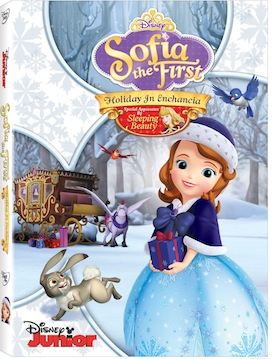 Your child will surely love this new 113 minute DVD as Sofia the First celebrates family in her first Winter Holiday at the castle. King Roland goes missing, Sofia, her mother, James and Amber go on an adventure searching for King Roland. Throughout the journey all sorts of things happen along with a special appearance from Aurora. Your children will surely love this adventure and make it a soon to be winter must DVD. You can purchase a copy of this DVD at your local Walmart and other retail stores along with Amazon. Cozy up to another fun filled adventure in SOFIA THE FIRST: HOLIDAY IN ENCHANCIA on Disney DVD November 4th with a special appearance from Princess Aurora! The DVD is value packed with four additional episodes and a FREE light up holiday ornament. My favorite has always been Beauty and the Beast.